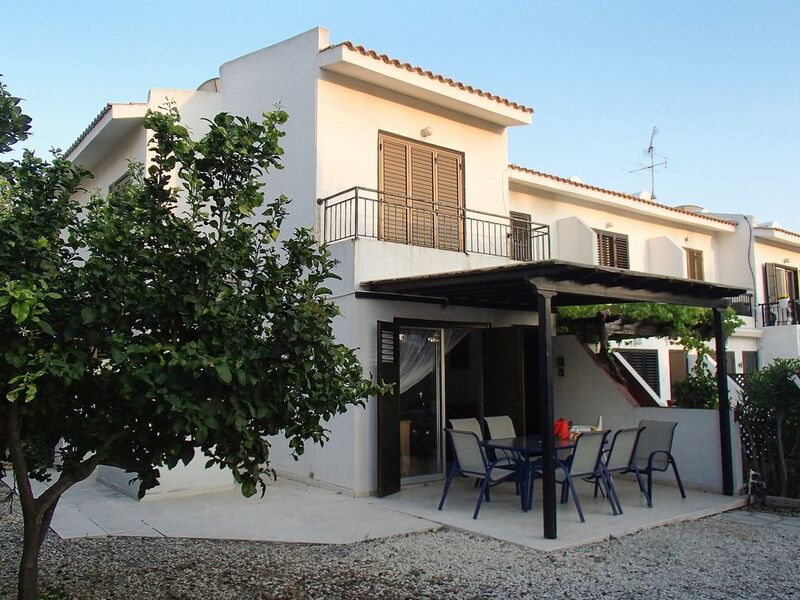 3 Bedroom House (sleeps up to 8) in Kato Paphos. With large shared pool, close to beach & restaurants and fully air conditioned. A beautiful family house situated in a fantastic location in Kato Paphos. It has a large shared pool with secure gated entrance, air conditioning in all rooms, an outdoor dining and barbecue area with plenty of space, making it perfect for a large family or even two families to enjoy. Facilities include free private wi-fi and a 40 inch flat screen TV. There are over 200 English TV channels, including all sport and movies included in the cost. A Cyprus style barbecue is available to use in the large open barbecue area at the front of the house, great for socialising out in the warm evening air. Indoors there is a large living/dining room with separate fully equipped kitchen. The harbour and beaches are a 10 minute walk away from the house and an even closer 2 minute walk away is a large selection of bars and restaurants. The popular tourist attraction, Tomb of the Kings and the brand new indoor shopping mall and cinema complex are also just a short distance away. The wonderful local attractions of Coral Bay beach, Aphrodite's Rock and Adonis Baths are all within a short drive and there are golf courses, Go Karts, bowling, quad bike hire nearby for people wanting lots of activity. Myself, my Mum, Brother and Sister bought this house as a holiday home in 2009. We wanted somewhere that we could go to as a family (that is ever-growing with children!) to create lots of happy memories. We decided to rent it out for others to enjoy as it seemed a shame for it to be standing empty when we were not using it. We wanted a property that felt like home from home and was easily accessible to everywhere that we wanted to enjoy. When we looked around this house, it fitted all the requirements perfectly! Upstairs has the main bathroom with bath/shower, hand basin and wc. Downstairs has fitted shower cubicle with wc and hand basin. There is air conditioning provided in the living/dining area and all three bedrooms. Towels and linen are included and the property is cleaned before and after guests arrive. An optional mid-stay clean is also available for £30. The house has a large, open plan living room with dining area. Includes 2 sofas (one being a sofa bed), drinks tables, dining table with 6 chairs, air conditioning, ceiling fan and 40 inch TV. In the living/dining area there is a solid wooden dining set that includes six chairs and two stools, making seating for eight. There is also a highchair for a child. Guests are welcome to use and leave books in the house. We have a small selection of board games in the house. There is a large patio area at the front of the house which is excellent for sitting outside in the evening and eating and drinking with friends/family. Skiing is available during the winter months in the Troodos Mountains in the centre of the island. The shared 15m pool is around the corner,30 seconds walk from the front door. It has a secure entrance and the key fob is supplied to guests for access. It has plenty of sunbeds and umbrellas for use. We look after our holiday home like we look after our family home and this should ensure that you have a fantastic stay whilst in Paphos. If you need any help or advice when you are in the house, myself or the people who look after the house, are available for contact throughout your stay. The house is within 1/2 mile of the seafront with harbour, designated swimming areas with changing rooms, coastal path and two small sandy beaches with seafront bar/cafes. The larger beaches - such as the large tourist area of Coral Bay, with paragliding, jet ski and banana boat hire etc. are a 15 minute drive away and has a regular bus service to and from. There are many quiet secluded and beautiful golden beaches scattered along the nearby coastline. The nearest airport (Paphos) is within a 20 minute drive and there are many car hire companies offering cars for hire for less than 100 Euros per week. There is however, a regular bus service (and taxis) from the airport that stops just a few minutes walk from the house so a hire car is not essential. The house is within 2 minutes walk of a large selection of bars and restaurants and the beach and harbour are a 10 minute walk. Coral Bay is 15 mins drive away with it's fantastic golden beaches. Latchi is approx 30 mins drive and caters for all water sports as well as being popular for high quality and affordable local food tavernas. The town of Polis is approx 30 mins by car, it is a thriving town catering for tourism and traditional crafts and with restaurants for all tastes and budgets. There is a large air conditioned supermarket within walking distance of the house and a 24 hour convenience store is within 3 minute walk for those essential items. The short walk into town provides all the amenities such as banks with ATM, tourist information, bus stops, vast choice of eateries and outdoor bar areas with sea views.